Summerhouse Townhome #2 is a colorfully and beachy decorated two story townhome, just across the two lane (30 mph) Scenic Gulf Drive (Old 98) from the beach located at 2000 Scenic Gulf Drive in east Destin/Miramar Beach. 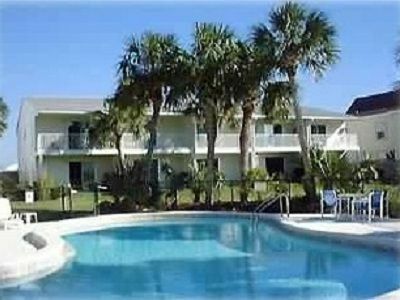 Super location just east of the busy downtown Destin but located in the quiet and quaint Scenic Gulf Drive area where you can actually drive along the beach road and see the Gulf of Mexico. Mainly townhomes and low rise condos. Convenient to an abundance of shopping, groceries stores, and restaurants either direction of the townhome. Located midway between Silver Sands Designer Outlet, Sandestin Grande Boulevard, Winn Dixie, upscale restautants to the east and Publix, Walmart, Lowes, Home Depot, Fresh Market, and many restaurants to the west. One block to a lovely beach park with beach toys such as waverunners, kayaks, umbrellas and chairs, and within a short walk to Pompano Joes Seafood and Bar and Whales Tail Restaurant and Beach Bar, 2 beach walkovers, one located at the end of Holiday Road for quicker access or the Ciboney Beach access. Awesome New jogging/bike trail that runs along the coast. The quiet area of Destin, yet convenient to Outlet shopping Mall in Sandestin, our seven Golf Courses, Water Attractions for the children, Fishing Boat Charters, and many more restaurants. The unit has been freshly painted, new 20" travertine looking tile and new Kraftmaid kitchen cabinets and Silestone Quartz countertops! New large mounted flat screen smart TV in family room. Large flat screen TV, Queen mattress and bedding in Master Bedroom with Caribbean theme. 2nd Bedroom has a new King size bed for 2 persons. Have a queen air mattress for kids if needed! Townhome living is so convenient for those that want to drive right up to their unit and avoid elevators and grill out on their own patios! Great with kids because they can walk right out and play in the huge lawn right out sliding door! Spacious townhome with about 1275 square feet with the bedrooms are on the second floor with 2 full baths up, and kitchen, dining room, living area, and 1/2 bath on the ground floor where you can walk right out to the kidney shaped pool and lush tropical courtyard. Nice for the kids because there is plenty of grassy area to play in and easy for you to watch. Unlike condominiums, there is your own gas barbecue grill on the private ground floor patio with patio table and chairs. The units Sleeps 4 persons comfortably. Will allow 5 people but one will be on sofa or air mattress. The master bedroom has a balcony that overlooks the open courtyard. Sorry the sofa does not pull out into a bed. This is my personal unit so I take much pride in the unit and want it cared for as I would. You will love it and find it very comfortable. Call Jody to reserve the unit today with MasterCard, Visa, Diner card, Discover, or personal check if necessary. I will professionally email you a Confirmation, Policies, and Directions. The door to the unit will be left unlock. If the unit is paid in advance the keys will be left on the kitchen counter, if not my father who is a Florida Real Estate Broker and our Manager will come buy and collect the rent and give you the keys after you get settled in. Once you arrive, deposit is refundable as long as there are no damages and you show up. You may cancel prior to 30 days of the arrival. If a Hurricane Warning is issued for Destin you will not be obligated to the rental. All deposits and rents to be returned. If already in Destin when ordered to evacuate, rent will be returned to you on a prorated daily basis of unused nights. This is my 23rd year of renting my own personal units out for vacations, so I do know what you expect in a comfortable, exceptionally clean, and memorable vacation rental. I am also an experienced past Realtor of the Destin market and may be able to answer any real estate questions. My father, Ray Feiler has 35 years experience as a Real Estate Broker of the local Destin market. Ray can help you find your second home, Investment property, or dream beach home! His cell number is (850) 837-9344. Book early because the units are on average about 98% occupied in the spring and summer! Look forward to having you stay, you will be glad you did! Check out our reviews! We first discovered Destin in the early 1980's and fell in love with it. I moved there from 1991- 2002, what a wonderful experience. Today I travel back and forth from Indiana to Destin at least 4 times a year to work on the rentals and see my father who still lives there. It will always be my second home and I have no desire to ever go anywhere else in Florida but Destin. You will see what I mean. I have many good friends there that I treasure and wonderful memories and many more good times I hope to have. We are a hands on type of family and do most the work ourselves including the renting of the units. We can be more flexible on price versus a property management company that charges the high fees to the owners that pass those prices onto the renters. I am a Realtor in Indiana and still hold a Florida real estate license and I have been renting my families units since 1993. There are no worries for you, I will get you a professional confirmation emailed to you asap, with detailed policies and directions. My father is there to collect the rent and make sure all goes smooth sailing there. In 16 years I have had but a handful of issues that were resolved quickly and fairly. Please give me a call I am sure you will be glad you did. Please call my cell for any questions you may have. We absolutely fell in love with Destin, as you will too. It was undiscovered when we first set eyes on it and now the world knows about it and we want to share it with you. Awesome convenient beach location to shopping as close to Silver Sands Outlet Mall and the new Destin Commons. So much to shop and see, lots of restaurants both ways. Only about 150 yards to private beach area. Small view from upstairs 2nd floor Master Bedroom private balcony of townhome. Please bring your cell phones. No longer have land line. Before departure strip beds of dirty used sheets. Towels provided but no towel service during stay. Most towels need washed and put back in closet prior to departure to help out cleaning service with short turnover cleaning time. FREE Cable Wireless from your laptop! Desk area available. New Remodeled Kitchen with new off white cabinets and beautiful Silestone countertops. Has about everything you can dream of for your cooking needs. Spacious kidney shaped pool recently retiled and resurfaced in a nautical deep blue tile and brick paver pool deck with lots of seating for all. We had an amazing stay at the townhouse. Very close to the beach, about 5 min walk. We will definitely be back to stay on our next Destin vacation! The townhouse was perfect for me and my family. This place was roomy and very well furnished. We did not have to bring anything but our clothes! The pool is also very nice. We enjoyed everything about our stay and Jody and her father was great and easy to deal with. Finally made it back to Destin! Loved it! But lots of catching up on cleaning, fixing, and improving! I hope my rental guests enjoy the unit as much as I do. So comfortable, now very clean and great location. Will be buying new king bedroom set this winter! Hope you all come back! We really enjoyed our stay at Summerhouse #2. Would definitely stay there again. Just a shot walk to a beach access. GREAT location for the price - could not be happier! Summerhouse #2 is two-tenths of a mile (~3 mins) walk from beach access. The area that you access is a low-usage spot (compared to what we saw up and down the beach). The townhome is well stocked with essentials, and includes a washer and dryer in the unit (other guests we talked to had to use community washer/dryer on the property). We slept five easily - two adults and three large teenage boys! Easy access to the scenic highway, Pampano Joe's, and a short drive to everything you love about the Destin area! Jody and Ray were fantastic to work with and we hope to re-visit in the future! Highly recommend! Thank you so much for the great review!!! Hope to hear back soon from you all! #2 Summerhouse is decorated so cute. It had everything we needed. And the beach was just across the street! Thank you, so glad you enjoyed your stay and the colorful beachy décor! New Bike/Jogging path along Scenic Gulf Drive, 30 mph traffic, only 2 lanes!